It’s morning and that means one thing and one thing only: coffee. There’s nothing quite like opening up a fresh bag of beans, smelling the lovely aroma, and sipping on the final product with my hands wrapped around the mug for a full warm and cozy effect. Because of my coffee obsession, I was on the hunt for a new coffeemaker before I moved for the Georgia O’Keeffe Internship. Sleek, minimal, elegant. I immediately imagined pulling it out of a cabinet to share with friends after a long dinner, (or in the morning if I wanted the full eight cups to myself). After drooling over the product, I decided not to buy it. I left those eight cups of coffee for a “someday” down the road. -Letter from Georgia O’Keeffe to Maria Chabot, January 18, 1944. Maria Chabot Archive. Georgia O’Keeffe Museum. Miss O’Keeffe expresses the simplicity of the product, a simplicity reflected in her lifestyle and artwork. A few days after seeing this, we began our first day of cataloging in the Ghost Ranch kitchen where I found myself describing that Chemex. Little did I know Miss O’Keeffe shared an interest in this product and in coffee. I couldn’t help but smile. Amidst these thoughts, I see the many parallels between cooking and creating artwork. They are both about process, and Georgia O’Keeffe’s process was one of intentional, deliberate steps. 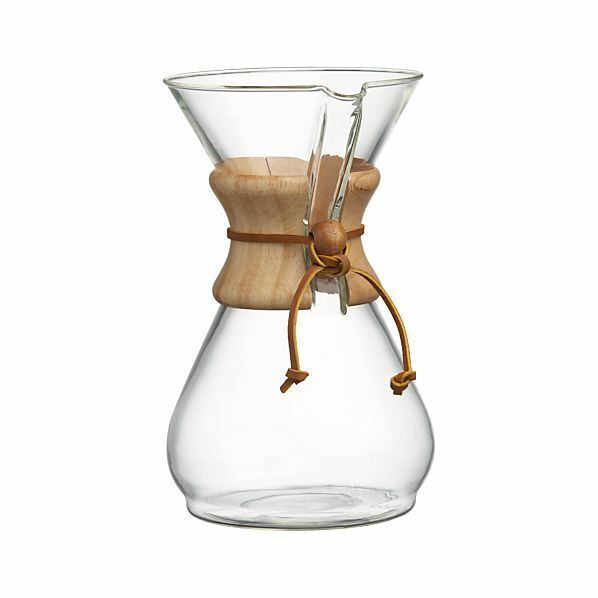 To prepare coffee: pour the beans, grind the beans, filter the grounds, sip. Or to prepare a salad for lunch: wash the lettuce, tear the lettuce, chop the vegetables, toss. And to create a painting? Visualize the image, sketch the image, stretch the canvas, paint. Both cooking and artwork require one’s imagination to think of what to create, one’s hands to make that creation, and one’s appreciation to enjoy the end result with others or by oneself in quiet contemplation. 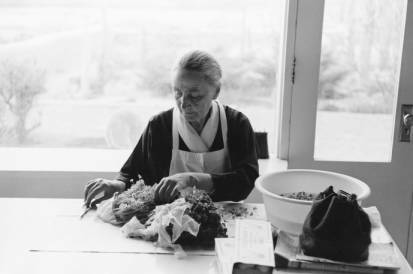 “She had an ability to describe precisely the manner in which her food should be prepared, as well as the taste and texture that she desired” (Wood 35). This exact, deliberate vision for food preparation clearly carries over into O’Keeffe’s artistic practice. Her paintings show the confident lines she used for crisp contours, mirroring the direct specifics of her cooking style. The pure ingredients from the garden equate to her high-quality art supplies. Her sketches are like recipes, revealing her plan before putting paint to canvas. O’Keeffe’s attention to each particular step of a meal and of a masterpiece reflect the shared process of cooking and art. Just as food is an integral part of our lives that keeps our bodies moving and breathing, O’Keeffe shows through her intentional practice that art is equally nourishing to our souls. Perhaps Miss O’Keeffe recognized these overlapping patterns and not only saw her world through the lens of a camera or a bone, but also through food, conscious of its essential place in our lives. Put the dry ingredients in a large bowl and stir together to blend them. Mix the buttermilk, oil and egg in a smaller bowl. Add the liquid ingredients to the dry ingredients and stir just enough to make the batter fairly smooth. The batter should be somewhat thick but drip easily off a spoon. Allow the batter to sit for three to five minutes. Meanwhile, lightly oil an iron griddle or iron frying pan and heat to just below “smoking”. Pour the batter onto the heated surface. Turn the pancakes when they bubble on top, and are moderately brown on one side. Remove from the griddle when the pancakes are browned on both sides. Serve with warmed butter/oil mixture and warmed pure maple syrup. Wood, Margaret. 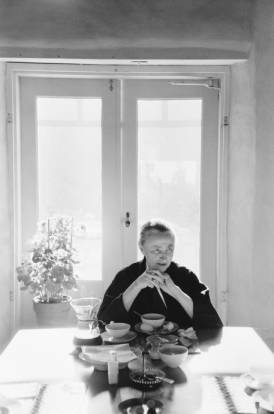 A Painter’s Kitchen: Recipes from the Kitchen of Georgia O’Keeffe. Santa Fe: Museum of New Mexico Press, 2009. Print.